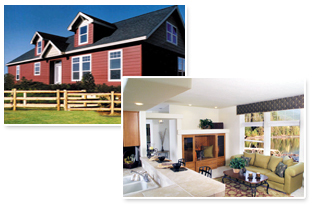 Guerdon Homes offers affordable custom home elegance for every lifestyle and budget. The quality control inherent in Guerdon’s off-site construction process results in homes that are superior in quality and performance. Through the use of factory technology, Guerdon Homes are produced year round in a climate controlled environment by a reliable and highly trained workforce that is dedicated to building your home with precision-quality, on time and on budget. Guerdon is committed to custom innovation in their home designs and has a wide variety of floor plans to choose from. Guerdon homes are built in a factory under cover in a controlled environment, with everything at one location. There are no expensive subcontractors (meaning different contractors for different tasks, i.e. cabinet makers, flooring installer, plumbers, electricians, etc.). It is a team of craftsmen working in a well-organized assembly workforce. There are no weather conditions to contend with, and very high volume buying allows materials to be considerably less for a Manufactured Home factory than for an individual contractor. Whether you are a developer looking for a custom home development, or you are looking for a home for yourself, Guerdon offers custom choices and superior quality in faster time and at lower cost.